The Best UK Marketing blogs from thousands of top UK blogs in our index using search and social metrics. Data will be refreshed once a week. UK Marketing newsletter is a comprehensive summary of the day's most important blog posts and news articles from the best UK Marketing websites on the web, and delivered to your email inbox each morning. To subscribe, simply provide us with your email address. London About Blog Marketing Week is a leading UK magazine for marketing jobs, marketing news, opinion and information. Covering advertising, media, pr, online marketing & branding across all industries. Facebook fans 99,526. Twitter followers 207,894. Englefield Green, UK About Blog The Marketing blog provides UK marketing and advertising news, opinion and feature commentary. Written by Will Corry, it provides insightful, informed no-holds-barred commentary on the state of advertising and media. Facebook fans 144. Twitter followers 18,596. Bristol, UK About Blog MarketingTech pulls in the most insightful, informative and up to the minute blogger content from leading websites around the web, providing access to the latest thought leadership on technological developments from across the global marketing industry. Facebook fans 7,276. Twitter followers 7,884. Leeds, England About Blog Smart Insights are a publisher and learning platform that helps our members plan, manage and optimize their marketing using our downloadable planning templates, guides and interactive learning tools. Our daily advice and updates on digital marketing covers the most important developments that are important to business marketers and business owners. Facebook fans 61,077. Twitter followers 24,183. London, England About Blog In-depth training guides, long form content reports and blog posts from the Distilled team. Topics include: SEO, mobile, social, CRO and PPC. Facebook fans 8,422. Twitter followers 40,070. London, UK About Blog BuzzSumo offers social insights for content marketers to help you formulate your content strategy and discover outreach opportunities. Facebook fans 11,050. Twitter followers 18,212. About Blog My name is Matthew Woodward & If you want to learn internet marketing over the shoulder of an established expert this blog is for you. Facebook fans 32,976. Twitter followers 17,433. About Blog We Are Social. We are a global agency. We deliver world-class creative ideas with forward-thinking brands. We believe in people, not platforms and the power of social insight to drive business value. We call this social thinking. This marketing blog has its own ideology that promotes the power of social insight. The domains they cover are social, digital and mobile. Facebook fans 136,543. Twitter followers 83,120. London About Blog Campaign is the world’s leading business media brand serving the marketing, advertising and media communities. Campaign’s mission is to provide professionals from across the marketing, advertising and media communities with the creative firepower they need to attract and delight consumers. Facebook fans 24,492. Twitter followers 171,036. Worldwide About Blog Meltwater is a media intelligence company who provides media monitoring and social media monitoring to help companies grow and build brand. Facebook fans 26,592. Twitter followers 20,780. London, UK About Blog Moosend is a European Εmail marketing Service Provider that helps companies operating online to ease the burden of sending their email campaigns. Follow us to keep up with news and articles on email marketing. Facebook fans 8,324. Twitter followers 1,506. Nottingham, UK About Blog This blog out of Nottingham is a mix of posts about industry news & observations, training programs offered by Susan Hallam and aggregated Tweets. Making all of one’s tweets for the day into a blog post is automatic and therefore easy for the blogger to create an entry, but the real question is whether it offers useful info to blog readers? In this case I think sometimes yes and sometimes no. Facebook fans 838. Twitter followers 2,406. Brighton, UK About Blog Follow us to keep up with Articles based around email marketing, best email marketing practices to improve your results and more from Pure360 Email Marketing Blog. Facebook fans 945. Twitter followers 7,526. Facebook fans 1,845. Twitter followers 16,474. UK and Ireland About Blog Latest News from Text Marketer Ltd - the leading Web to SMS, SMS Advertising and Bulk SMS provider. it's mission is to help you get the best possible results from SMS. Facebook fans 178. Twitter followers 1,163. UK About Blog The UK’s leading provider of software for PR, communications, public affairs & stakeholder engagement. We provide media intelligence solutions and communication insight that help our clients plan, manage and measure their communication performance and ultimately, build their reputation. We believe that a targeted and efficient communication strategy can result in real business benefits. Facebook fans 2,562. Twitter followers 6,361. United Kingdom About Blog An online magazine for the modern marketer & digital industries, with news, articles and commentary on digital marketing. Facebook fans n/a. Twitter followers 7,617. Peterborough, Leeds & London About Blog Zazzle Media is a content-led and data-informed digital marketing agency specialising in SEO, content creation and distribution and social media marketing. Our goal is to build targeted audiences of long term value for every client we work with through search, social and influencer channels. Facebook fans 2,652. Twitter followers 3,129. Aylesbury, Buckinghamshire, UK About Blog Cobloom helps SaaS Startups to find traction and scale growth in a repeatable, predictable and data-driven way. Get the latest B2B SaaS growth tips, strategies & advice fresh from the Cobloom blog. Facebook fans 166. Twitter followers 2,725. Nottingham, UK About Blog Impression is a digital marketing agency that delivers outstanding results through SEO, PR, PPC, content marketing and web design. In Nottingham and London. SEO and the landscape of online marketing is always changing. At Impression, we are always keeping up to date and discussing the latest trends. Facebook fans 473. Twitter followers 1,414. London About Blog B2B Marketing Blog by Velocity Partners consists of tips and advice about B2B Marketing, Content Marketing, Digital Marketing, B2B writing and other related topics. Facebook fans 1,071. Twitter followers 4,959. Facebook fans 2,228. Twitter followers 5,067. Chester, London, Nottingham About Blog Clicky Media are a multi-award winning team of digital marketing experts based in Chester & London. Want an insight into the tips & tricks of digital marketing? Read our agency magazine for the latest news & trends from the digital marketing industry! Facebook fans 1,387. Twitter followers 5,901. Manchester, UK About Blog PushON is an award-winning full service ecommerce agency that provides a complete range of web development and marketing services. PushON's digital marketing blogs bring you the latest news, insights and opinions on Magento, SEO and topics that are essential to the marketing community. Facebook fans n/a. Twitter followers 9,223. Nottingham, UK About Blog Stay up to date with the latest web design, creative design and digital marketing news on our award winning Fifteen Design digital blog. To deliver exciting, new and bespoke creative solutions to achieve and exceed your business potential. Facebook fans 566. Twitter followers 3,061. Facebook fans 2,880. Twitter followers 2,488. Wells, Somerset About Blog Cognique are an effective outsourced digital marketing agency. Our design, marketing and technology know-how generates more business for our clients. Read Cognique blogs about graphic design, websites and digital marketing, WordPress and marketing automation. Facebook fans 117. Twitter followers 630. Brighton, London About Blog SiteVisibility is a search marketing, social media & SEO agency. The SEO and social media experts at SiteVisibility provide useful advice and news on the SEO, PPC and digital marketing industry. Facebook fans 592. Twitter followers 4,773. United Kingdom About Blog Read the Print-Print blog, advice on branding and promoting a small business - with helpful design ideas and marketing tips along with artwork tutorials to help with your next print campaign. Facebook fans 1,026. Twitter followers 1,265. Facebook fans 570. Twitter followers 1,689. Scotland About Blog Digital Impact connects your businesses with your target market using outstanding websites, innovative marketing campaigns and striking design. Keep up to date with the latest digital marketing news and goings on from the expert team at Digital Impact. Read about how to improve your business today. Facebook fans 156. Twitter followers 611. Derby, UK About Blog The UK's number one link building team. Personable and technically skilled SEO people that thrive on getting great results. Facebook fans 218. Twitter followers 2,049. UK About Blog UK-based inbound marketing agency helping clients increase traffic, improve usability and boost conversions. Facebook fans 270. Twitter followers 1,012. Essex, United Kingdom About Blog Award-winning digital marketing agency. Web design to results driven online marketing solutions including SEO, PPC, CRO and content marketing. Keep up-to-date with the latest innovations, trends and strategies in the digital world. Subscribe to the Coast Blog for the most informative digital views. Facebook fans 442. Twitter followers 3,149. London About Blog Our goal is to provide easy to use, powerful email marketing solutions with excellent customer support, to ensure you build professional, successful email marketing campaigns time after time. Subscribe us to keep up with articles on email marketing. Facebook fans 184. Twitter followers 683. City of London, London About Blog Welcome to our Inbound Marketing Blog. We release articles on a weekly basis, make sure to subscribe and let us know your thoughts on each article. Facebook fans 22. Twitter followers 5,591. Facebook fans 176. Twitter followers 2,455. York, England About Blog A marketing agency with a great personality! Read about the latest up to date news in the world of social media and from Pick and Mix HQ, including our recent projects. Facebook fans 1,066. Twitter followers 1,575. Shoreditch, London About Blog The Think Tank is one of the UK's leading B2B marketing agencies offering a complete range of marketing services, including brand development, strategic thinking, tactical marketing campaigns, digital communications, PR and design. Facebook fans 654. Twitter followers 42,839. Facebook fans 420. Twitter followers 8,071. Manchester, England About Blog Marketing Aspects Magazine is aimed at businesses that are looking to either raise their profile, reach a specific target audience, attract more customers and of course, generate more business. Facebook fans 14. Twitter followers 7,950. Facebook fans 27. Twitter followers 1,246. Derby About Blog Hello. We’re Katapult, a marketing agency where creative ideas and commercial thinking help our clients to build brands, hit targets, drive growth and deliver a better experience for customers. Here you will find Advice, guides, news and reviews from all things design, digital, marketing and more. Facebook fans 628. Twitter followers 2,914. Oxfordshire About Blog BabelQuest is a UK Inbound Marketing and Inbound Sales Agency and Gold Hubspot Certified Partner, on a mission to help businesses grow. We can Help Your Business Grow Using Inbound and HubSpot Work with us or learn from us to transform your marketing and sales. Facebook fans 95. Twitter followers 438. Bolton, Lancashire About Blog Welcome to Bring Digital, the agency that's been in your shoes. Find out how we can use our in-house experience to get the results you deserve. Facebook fans 713. Twitter followers 1,856. Facebook fans 241. Twitter followers 2,527. Milton Keynes, UK About Blog We're a UK based digital marketing agency focused on the success of organisations within the construction industry and the built environment worldwide. Facebook fans 317. Twitter followers 3,578. London About Blog Promomarketing .info is the leading online source of news, reviews and in-depth features and analysis about all aspects of the promotional marketing industry in the UK. Facebook fans 4,427. Twitter followers 2,628. London, Midlands, Palma About Blog Cognition is a integrated marketing agency based in London & the Midlands, providing Business Intelligence. Read our Marketing Blog today for industry news, marketing tips and insight. Facebook fans 502. Twitter followers n/a. Facebook fans n/a. Twitter followers 7,173. Manchester About Blog From the latest developments on social media to industry news from Google, we aim to keep you up to date with all the important things in the world of SEO, social media and paid advertising with our blog. As well as a weekly news roundup we also regularly post content on topics such as web design, search engine optimisation, social media and online marketing so make sure you come back regularly. Facebook fans 584. Twitter followers 2,231. London, UK About Blog Umi Digital helps increases direct bookings through innovative digital marketing techniques. Join our industry-leading Umi 360 hotel marketing platform. Get the latest info from our professionals about hospitality, hotel marketing, restaurant marketing and hostel marketing through our Umi Digital blog! Facebook fans 341. Twitter followers 1,488. Tarporley About Blog Solve Legal are a Cheshire based agency providing PR, Marketing & Design Services for law firms, lawyers & legal services across the UK. Marketing Insights for Law Firms & the Legal Sector in the Solve Legal Marketing blog. Expert marketing advice and services for law firms. Facebook fans 9. Twitter followers 112. Norwich, UK About Blog LinkedIn Training to help businesses & individuals get the best from LinkedIn. Dorset About Blog Upperdog is a creative digital marketing agency based in Bournemouth, Dorset, providing innovative and effective solutions to conquer the online world. Facebook fans 1,220. Twitter followers 652. UK & IRE About Blog At Retail Marketing we aim to empower, support and invest in our people developing on their ambitions throughout their employee journey. Facebook fans 1,334. Twitter followers 1,072. Oxford and Milton Keynes, UK About Blog We are a marketing services provider, delivering highly effective, data-driven integrated B2B campaigns. Follow us to keep up with articles on B2B Marketing from Cyance. Facebook fans 135. Twitter followers 1,007. UK About Blog The Opportunity Marketing blog is designed to give valuable marketing tips and advice on how to strategise and market your small business effectively. Facebook fans 232. Twitter followers 1,722. Manchester, UK About Blog Manchester's leaders in profitable digital marketing, ecommerce, web design & development, and conversion rate optimisiation. Facebook fans 323. Twitter followers 1,421. United Kingdom About Blog Fieldworks Marketing provides industry expertise, content and access to decision makers, to help you generate new business and build a position of influence in your markets. It is an innovative BtoB agency providing marketing, PR and social media services to retail technology businesses across the globe. Our digital marketing blog posts aims to push the boundaries on retail thinking and showcase industry leaders treading new ground. Facebook fans 1,832. Twitter followers 2,304. Glasgow | London About Blog Kommando is an experiential marketing and brand experience agency based in Glasgow & London. We are experts in experiential marketing, guerrilla marketing, ambient advertising and live marketing. Facebook fans 947. Twitter followers 1,917. Bolton, England About Blog We're an inbound marketing & certified Growth Driven Design agency. Your one stop shop for all the latest news in SEO, content marketing, inbound marketing, conversion optimisation and Growth Driven Design news. Facebook fans 82. Twitter followers 3,543. Glasgow, Scotland About Blog Clockwise is a full service marketing agency offering a range of integrated services to help your business reach its full potential. Read our marketing blogs for our thoughts on all sorts. Digital, social media, branding, website development, marketing trends and more! Facebook fans 1,320. Twitter followers 146. London About Blog BrightBull's blog gives you tips and ideas on B2B Marketing, ranging from inbound marketing to step-by-step guides. We create and put into action effective BtoB marketing strategies and campaigns built around great content. That's how BrightBull meets targets, generate leads and boosts their ROI, again and again. Facebook fans 961. Twitter followers 4,197. Bristol, UK About Blog Digirank work closely with you, challenging existing thinking and developing creative online marketing strategies to propel your businesses forward. Effectively manage and transform your business online with our digital marketing resources and industry insights. Facebook fans 136. Twitter followers 1,078. Edinburgh, Scotland About Blog Looking for straightforward & practical marketing advice for your small business? Check out my sandstonecastles marketing blog! Facebook fans n/a. Twitter followers 1,435. Maidenhead, UK About Blog We’re an expert copywriting and marketing agency specialising in the creation of persuasive sales and marketing content for B2B companies. Follow us to keep up with Our latest content marketing thoughts, ideas and insights to help you build fuel better conversations with your audience. Facebook fans n/a. Twitter followers 536. Birmingham & London About Blog We build laser targeted campaigns. Whatever you sell, we reach Heads of Departments and their influencer networks. We get you in-front of your target audience and keep you there. Read Tips on making strategic marketing effective for your company and increasing your leads, sales and ROI. Facebook fans 61. Twitter followers 1,571. Southampton, UK About Blog The bandv team have been experts in marketing & branding for over 35 years. In our blogs we share the latest advice & tips from within the marketing world. Facebook fans 218. Twitter followers 1,656. London, England About Blog Saving entrepreneurs and small business owners countless hours with a simple all-in-one solution to online growth. We provide expert online business growth solutions for solopreneurs, small businesses and everything in between. Facebook fans 99. Twitter followers 2,167. Nottingham, England About Blog A new digital marketing company in Nottinghamshire looking to support established small to medium-sized businesses and start-up companies with their website maintenance and promotion. Freelance Digital Consultant offering support for small business owners in Nottinghamshire. Contact Mandy Hopkins for help promoting your business online. Facebook fans 15. Twitter followers 271. Blackburn, England About Blog Infused Media are a digital online marketing & web design agency based in Blackburn Lancashire. Marketing Insights and news from Infused media limited. Seo, PPC, Webdesign news UK. Facebook fans n/a. Twitter followers 1,143. Manchester, UK About Blog Our news, information, thoughts and insights from the world of brand, digital and marketing communications. Studio North is a brand agency based in Manchester UK specialising in branding, marketing and digital. Facebook fans 577. Twitter followers 7,428. About Blog The Book Marketing Society was launched in November 2004 with the objective of becoming the representative body of marketing within the book industry. As such, it champions marketing professionalism with the ultimate goal of expanding the UK book market. Facebook fans n/a. Twitter followers 2,335. Devon About Blog I set up Straight Marketing in 2010 after 13 years of working in a variety of business development and marketing communication roles within professional service firms. Facebook fans n/a. Twitter followers 806. Woking, Surrey, UK About Blog Established in 2007, Clever Marketing offers a range of integrated digital marketing solutions to clients looking to improve prospect engagement, lead generation and client experience. Surrey design agency blog covering the latest web design, digital, PPC & SEO news, topics, & insights from Woking marketing agency, Clever Marketing. Facebook fans 192. Twitter followers 1,433. Facebook fans n/a. Twitter followers 2,718. Facebook fans 359. Twitter followers 1,733. Hull, England About Blog GRO Marketing provide expert marketing solutions to help your business grow. We know how important it is to have a strong brand and online presence in 2018. Facebook fans 1,303. Twitter followers 1,534. United Kingdom About Blog Vanessa Lanham-Day’s OnTrack Marketing is all about becoming inspired to fulfil your business dreams by mastering the art of marketing. She is a Business growth inspirer, mentor and speaker, all about inspiring you to take action, with clarity about where you are going and what you want to achieve. Facebook fans 65. Twitter followers 3,004. Marldon, England About Blog I am 25 years old, I live in South Devon and love everything to do with Marketing! A day in life of starting your own business. Discussing marketing, digital marketing and small business life, follow my journey in full on my blog. Facebook fans 185. Twitter followers 205. Bath About Blog We’re a strategically-minded digital marketing agency that provides a range of services to span today’s dynamic and rapidly evolving digital landscape. Facebook fans 1,108. Twitter followers 920. Windsor About Blog I am a freelance marketing consultant with significant leisure marketing experience within blue chip organisations. Discover what is happening within the world of marketing in our via our regular marketing blog posts - we would love to hear what you think. Facebook fans 469. Twitter followers 447. Macclesfield, Cheshire UK About Blog Tips, news, and advice for improving online lead generation. Do better at search, social media, content, and branding.Dedicated to your online success, Webpresence offer a range of cost-effective inbound marketing solutions that deliver a positive ROI. Facebook fans 438. Twitter followers 8,966. Facebook fans 12. Twitter followers 6,084. Croxton Kerrial, England About Blog Ketchup Marketing is the No1 choice for website design & SEO. Find some inspiration to kick-start your marketing campaign. Facebook fans 180. Twitter followers 4,948. About Blog Passion for design and technology are the foundations of Mailigen. We wanted to create a platform that would help people connect digitally, but just like any entrepreneur, we fell down and got back up many times before Mailigen even managed to take its first steps. Find useful Email Marketing Ideas for practical use in email marketing, as well as the latest Email Marketing News & Trends. Facebook fans 2,604. Twitter followers 6,386. Sussex, England About Blog Dee is an avid writer and has been writing sales letters, brochures, flyers, surveys, blogs, questionnaires and more for 29 years. A fully-trained trainer, Dee delivers a number of marketing masterclasses and workshops in-house for businesses looking to train their employees or franchisees and on an individual delegate basis. Facebook fans 354. Twitter followers 4,730. 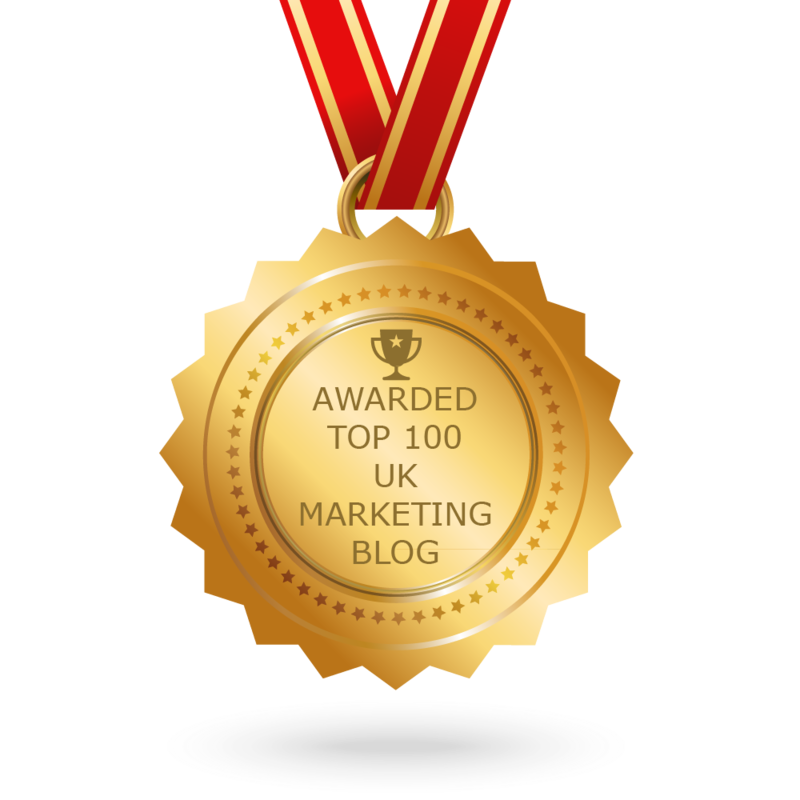 CONGRATULATIONS to every blogger that has made this Top UK Marketing Blogs list! This is the most comprehensive list of best UK Marketing blogs on the internet and I’m honoured to have you as part of this! I personally give you a high-five and want to thank you for your contribution to this world.